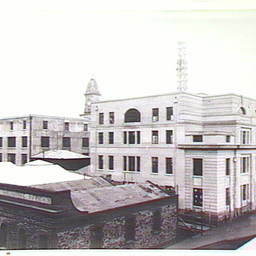 [General description] This building complex was constructed 1879-1881 for the Public Works and Registrar-General's departments. It was designed in the 'Renaissance Palladian' style by Melbourne architect Michael Egan. Part of the railings around Victoria Square gardens can be seen on the left. 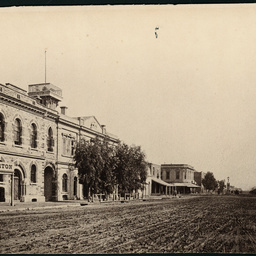 [On back of photograph] 'Acre 303 / North corner Wakefield Street and Victoria Square / Government Offices / in the 1880's'. 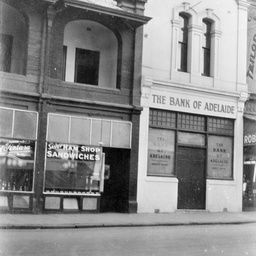 ACRE 49: Premises of the Savings Bank of South Australia, Hindley Street Branch. Architects: Caradoc Ashton, Fisher, Woodhead & Beaumont-Smith. 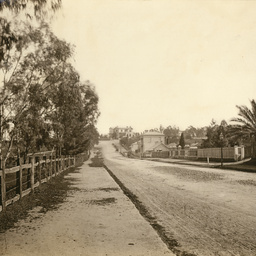 Pennington Terrace, North Adelaide, looking towards Montefiore Hill. The nearest lamp post stands on the boundary between Acres 705 and 704. The post and rails fence to the left marks the boundary of the parklands, where the Adelaide Oval is situated. 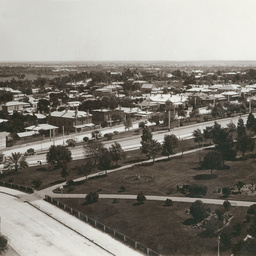 [General description] This photograph shows Brougham Place and Brougham Gardens, North Adelaide houses, parklands and distant suburbs. There is a new electric tram moving along King William Road. Compare with almost identical view, B 3461 taken in 1904, where the tram is horse-drawn. The left side of this photograph matches up with the right side of B 3463 to make a panorama. [On back of photograph] 'North Adelaide, looking south west from the North Adelaide Congregational Church / Acres 726, 727, 728, 729' (Another hand) 'Nov. 1910'. 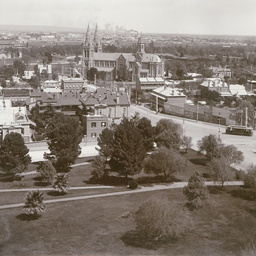 [General description] This photograph shows Brougham Place and Brougham Gardens, North Adelaide, and includes houses, parklands and distant suburbs. A horse drawn tram is heading south down King William Road. Compare with almost identical view, B 3460 taken in 1910, where the tram is electric. The left side of this photograph matches up with the right side of B 3462 to form a panorama. [On back of photograph] 'North Adelaide, looking south west from the North Adelaide Congregational Church / Acres 726, 727, 728, 729' (Another hand) 'About 1904'. 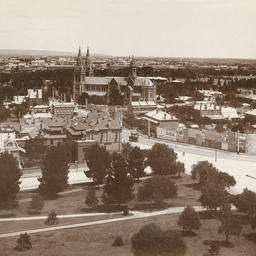 [General description] This photograph shows Brougham Place and Brougham Gardens, North Adelaide houses, parklands and distant suburbs. In the centre of the view a horse tram is making its way up King William Road. The left side of this photograph matches up with the right side of B 3492. [On back of photograph] 'North Adelaide, looking north west from the North Adelaide Congregational Church / Acres 726, 727, 728, 729' (Another hand) 'About 1904'. 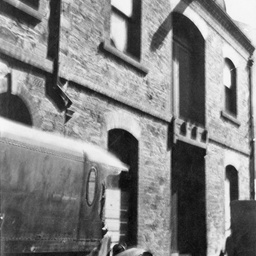 [General description] Buildings old and new: In the left foreground is the single storey stone building of the 'Advertiser' Steam Printing Offices. The new government buildings, with workmen busy and scaffolding still in place, dominate the view. The tower of the General Post Office can be seen in the background. [On back of photograph] 'Reproduced in the Chronicle, May 30, 1925 / New Commonwealth Government Offices completed in 1925 / Acres 238, 237, 210 / The low building in the foreground stands on the south east corner of Post Office Place and Marlborough Place (Acre 201). The north and west frontages of the new building are shown. The north frontage lies along the northern boundary of Acres 238 and 237. The west frontage is flush with the east side of Post Office Place and measures 25 yards. The extreme left of the photo is 12 yards east of Advertiser Place'. 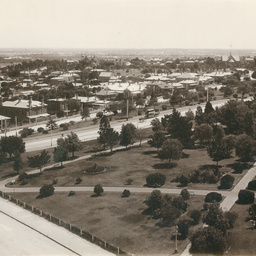 Young Street, west side, between Waymouth and Franklin Streets, Adelaide on 12 July 1922. The high wall on the extreme left is 54 yards north of Franklin Street; the extreme right of the view is 56 yards south of Waymouth Street. The houses stand in acre 197 and the Church mostly in acre 242, overlapping the acre boundary by 2 or 3 yards. 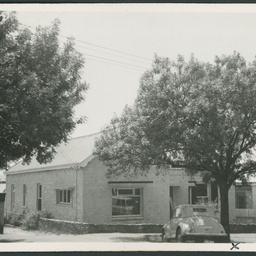 For a view of this church taken in 1956, see B 13725. 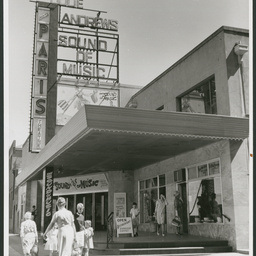 [General description] This modern long single story brick building features a gable on each end, bearing large signs advertising its business. 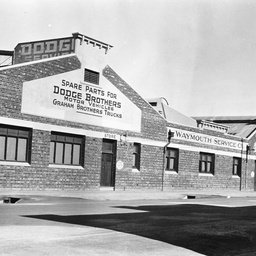 It is a sevice station and provides spare parts for Dodge Brothers motor vehicles and Graham Brothers trucks. 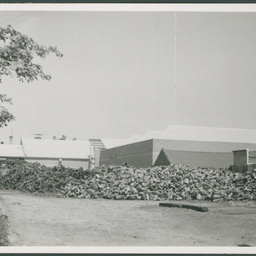 [On back of photograph] 'Acres 637 and 636 / Gilbert Street, south side / 20 May 1928 / Waymouth Service Co. premises (Dodge spare parts and service station) erected in 1927. For view of structures formerly on the site see B 4117 / Site of new building: Left side is 16-1/2 yards west of Tapley Street / Frontage: 54 yards / the cottages in the distance are on acre 636' (Another hand) 'For view of this building in 1952, see B 12446'. 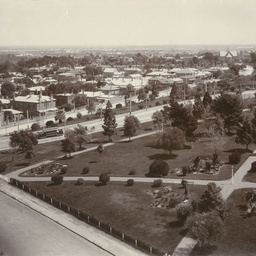 [General description] This photograph shows the intersection of King William Road and Brougham Place, including Brougham Gardens, North Adelaide. It features a panoramic view of buildings, parklands and distant suburbs. In the centre of the view an electric tram is making its way along King William Road. At the intersection large hoarding displays advertisements which include Terai and Amgoorie Teas, Hale Grocers and Hoopers Furniture. [On back of photograph] 'North Adelaide, looking west from the North Adelaide Congregational Church / Acres 720, 728, 729' (Another hand) 'Nov. 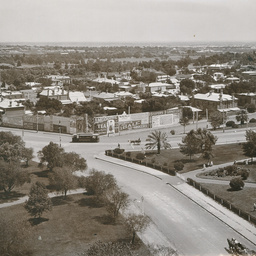 1910'. [General description] King William Road runs through Brougham Gardens and down past the Women's and Children's Hospital and St. Peter's Cathedral. There is a distant view of parklands and the city buildings. Some advertisements appearing on a prominent billboard are for the Coliseum Department Store, Burford's Soap, Fry's Cocoa, Amgoorie Tea and F. & H. Hale, Grocers. The right side of this photograph matches up with the left side of B 3490. [On back of photograph] 'North Adelaide looking south west from the North Adelaide Congregational Church / Acres 729, 730, 731 (Another hand) 'About 1904'. [General description] O'Connel Street runs through Brougham Gardens and down past the Women's and Children's Hospital and St. Peter's Cathedral. There is a distant view of parklands and the city buildings. Advertisements on a prominent billboard include Terai and Amgoorie Teas, Lion Flour and F. & H. Hale Grocer's. An electric tram is seen on O'Connell Street. The right side of this photograph matches up with the left side of B 3460 to form a panorama. 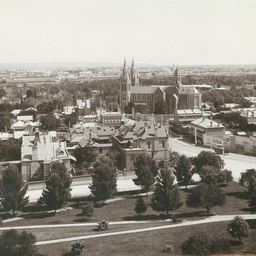 [On back of photograph] 'Adelaide, looking across St. Peter's Cathedral from the North Adelaide Congregational Church / Acres 730, 731, 720' (Another hand) 'Nov. 1910'. Morphett Street, west side. 15 July 1966. Acres 8 and 55. 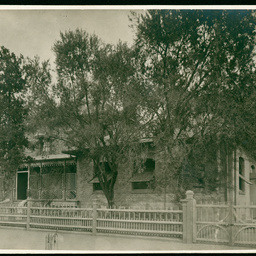 [On back of photograph] 'Acre 19 / North Terrace east, corner of Gawler Place (Site of Gawler Chambers) / Probably 1900-09' South Australian Company's second town office, pt. Town Acre 19, North Terrace / 1842-1913' (Another hand) 'Showing first olive trees grown in South Australia / The building was erected for the S.A. School Society and the trees planted 1839-40'. 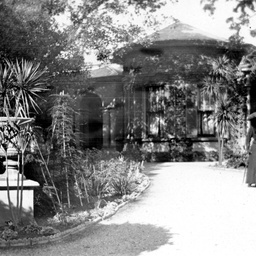 [General description] A man and woman pose for the photographer in the garden in front of the west wing of Ayer's House. [On back of photograph] 'Acre 30 (and a small part of Acre 29) Sir Henry Ayers' House, North Terrace, Adelaide'. 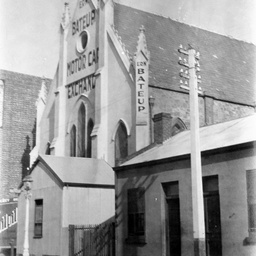 Wesleyan Methodist Chapel 1838 in Hindley Street was the first to be built in Adelaide. This was situated on Acre 48 close to the western boundary of the Acre, but about 20 to 30 yards back from Hindley Street. Copied from a sketch reproduced in the Christian Weekly and Methodist Journal, 11 May 1900. The first Methodist minister, Reverend William Longbottom and his family were shipwrecked on the Coorong en route from Hobart. It took the family 8 weeks to reach Adelaide. 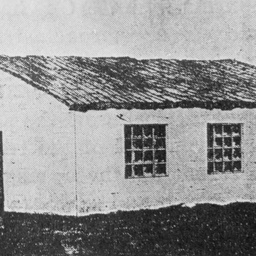 The foundation stone for the new church was laid in 1837 and the first service was held before the roof was erected. 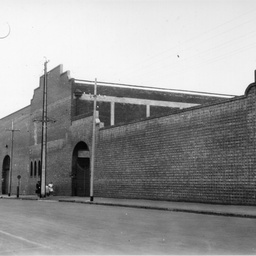 [General description] Outer walls of the West End Brewery complex in Hindley Street. On the right a brick wall is joined to an older stone one. Arched gateways for vehicle access can be seen further along. 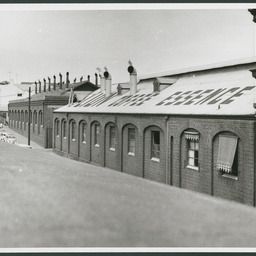 [On back of photograph] 'Acres 66, 67 and 68 / Hindley Street, south side / April 7th 1939 / West End Brewery / Building in centre completed in 1938 / Compare with B 6962 and B 7383 / The far end of the brick walling (4/5ths of an inch from left side of photo) commences to a point 13 yards west of Clarendon Street and continues westward for 86.5 yards / The point at which the near end of the brick walling meets the stone walling is the boundary between Acres 66 and 67'. 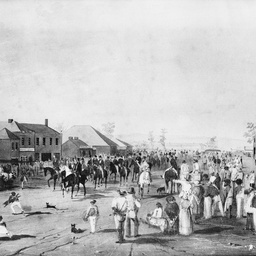 Departure of Captain Sturt's Expedition, King William Street, 10 August 1844. A crowd of onlookers watches the mounted Expedition members ride past along King William Street. City buildings are seen on either side of the road. [On back of photograph] 'Acres 78, 79,108 / Departure of Sturt's Expedition / 10th August, 1844 / Looking south down King William Street / from the coloured lithograph by S.T. Gill in George French Angas' 'South Australia Illustrated'. This reproduction has been made from the original sketch. B 7074 has been copied from a lithograph. A comparison of the two reveals differences in the Acres 78 and 108. James Place, west side, Rundle Street, Adelaide. 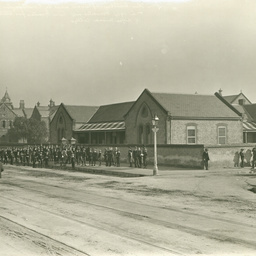 The premises to the right of the downpipe were demolished in 1923 before April. The downpipe marks the boundary between acre 80 and acre 107. For a view of premises subsequently erected see B 2589 and B 3243. 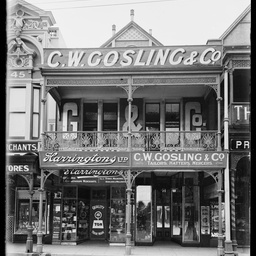 Rundle Street, south side showing the premises of C.W.Gosling & Co. frontage: 9 yards. 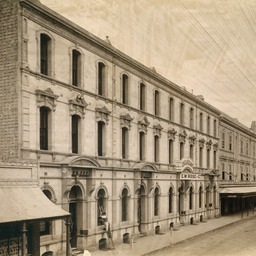 The building was demolished in November 1922, and replaced by the Haigh's Buildings. For a view taken on December 19th, 1923, see B 1855. 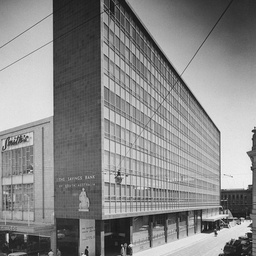 Acre 81 stands on the corner of Gawler Place and Rundle Street. The right side of Goslings marks the acre boundary, which is opposite the middle of Stephens Place. CW Goslings and Company was a tailors, hatters and mercers establishment. Arcade Lane, west side. Paris Theatre. 1966. All of the views in this series 16849/1-17 are filed under acre 103 except 16849/2 (Acre 84). [General description] Business premises on Currie Street. 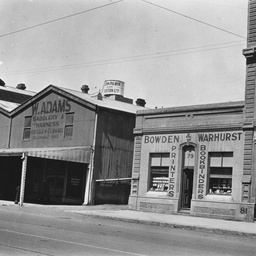 From left to right: Part of the John Bull hotel; W.Adams, Licenced Horse and Carriage Bazaar, Saddlery and Harness for sale or exchange; Bowden & Warhurse, bookbinders; J. Sankey's Auction Mart. [On back of photograph] 'Acres 136 and 137 / Currie Street, south side / March 24th 1931 / Galvanized iron premises demolished in 1931 (See B 6056) / Division between acres is between Bowden & Warhurst's and the big building on the right / Right side of Bowden & Warhurst's is 3.5 yards west of the east side of Kingston Street / Frontage of Bowden & Warhurst's: 8.5 yards / Frontage of lane: 4 yards / Frontage of galvanized iron premises: 21 yards'. 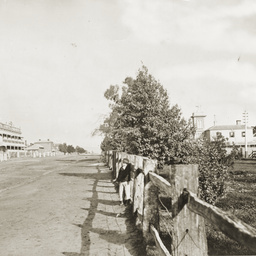 [General description] View west along a muddy and rutted Grenfell Street towards King William Street with Currie Street in the distance past Gouge's Fountain. The offices of the Register are partially obscured by trees. On the extreme left is Bennett & Barton, Land Auction Mart. [On back of photograph] 'Acres 141 and 142 / Grenfell Street / south side / Division between the acres is roughly the boundary between Bennett & Barton's and the two storey building next door / About 1866 / Bennett & Barton's were here for a few months only, their names not appearing in directories and rate books in this situation / The presence of Gouge's fountain means that the date is prior to 1868 and a comparison with B 105 where Bennett & Barton and the Town Hall tower are associated gives a date subsequent to the latter part of 1865 / The erection of the two storey building next to Bennett & Barton's was begun in 1865 (See B 5099) / It was still in process of construction in February 1966 (Register February 24, 1866, 5c). [General description] A small boy leans on a post and rails fence in front of a row of shrubs on the west side of West Terrace. A row of two storey terrace houses is seen on the left. The Adelaide Observatory (on the right), originally built for Sir Charles Todd was demolished in 1978. [On back of photograph] 'Acres 186, 125 / West Terrace, looking south from a point a little south of Currie Street / 1877-86 / The Observatory is shown on the right of the photograph / The division between acres 186 and 125 lies between the far side of the single storey cottages on the left and the near side of the two storied verandahed building / Photograph from an album of Sweet's views'. 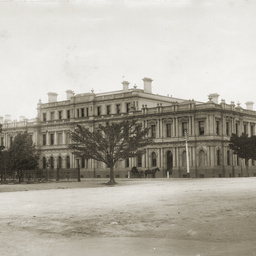 Acording to a researcher, the Adelaide Observatoy building was demolished in 1952, not 1978 and Adelaide High School was built in its place.